Weighty Matters: Can Salads Ever Be Considered "Fast" Food? I think it's an important question given all of the hoopla over the announcement that over the course of the next seven YEARS McDonald's will allow consumers to order side salads with their Big Macs and other sandwiches (see Marion Nestle's always thoughtful take on this here). So here's the rub as I see it. Salads aren't fast. I mean they're literally not fast. You can't really eat a salad on the run. Instead you have to sit down, tear open the dressing, dress the salad (sometimes more than once if the container is deep), toss the salad, use a fork, and chew a fair amount. Contrast that with sandwiches and fries that can be eaten with one hand, and which are designed to almost be swallowed without chewing. Perhaps that's why McDonald's reports that their current salad offerings (which have been on the menu for an awfully long time) only make up 2% of sales. And consider this. 65% of McDonald's sales come from their drive-thru windows. 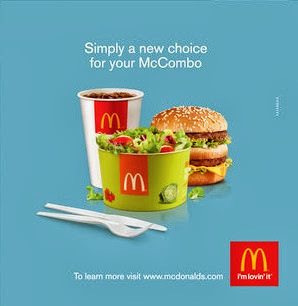 Take a peek at the McCombo in the advertisement put out by McDonald's to celebrate their announcement. Do you think that's drive thru fare? At the end of the day people go to fast food establishments for literally fast food. Unless someone can figure out how to make salads literally fast, putting them on menus is not likely to lead to salad sales, but it will likely lead to decreased scrutiny of McDonald's - something I have no doubt they're literally banking on.